Farming has always created communities, but new technologies are creating communities of farmers in new ways. As greenhouses free farmers from the constraints of their local climate, more and more consumers are increasing their demand for local produce. Together, these trends are opening up space for small farms to open up right where they’re planning on selling. According to IBISWorld, in 2013 two companies, Eurofresh and Village Farms, accounted for 34 percent of all hydroponic produce sales. The next closest company produced 3 percent of all sales. Most hydroponic farms occupy less than an acre of land, and average revenues for each farm are just below $200,000. As you might expect, these small farms are widely distributed geographically. Every state in the U.S. has some operating hydroponic farms, but no single state has more than 15 percent of them. This is a much wider distribution than conventional agriculture, and the competition between hydroponic farms is less likely to be for the same product because they aren’t forced to adapt to their region’s weather. Hydroponic farmers have little to lose by working together because they are usually selling far apart, but they have much to gain by sharing their experiences. Even if a farmer knew everything there was to know about the current technology and science, the landscape changes so quickly that the only way to stay an expert is to connect with others to find out what they are learning. The high initial infrastructure cost of hydroponic farming means that experimentation can be quite expensive, so crowdsourcing the effort benefits everyone. Some companies like Bright Farms, Freight Farms, and Crop King build farms located all across the country. These companies’ distributed networks can create a structured method for their farmers to share information, but more informal communities can include many more participants and therefore even more information. 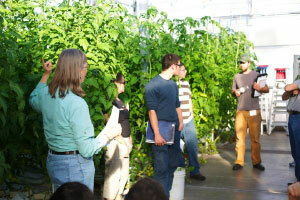 At the same time, training programs bring veterans and rookies together to see different setups and strategies with organizations like the University of Arizona and Crop King, while publications like Seedstock showcase success stories and industry news, creating a common community knowledge base. Communities surrounding new agricultural technologies like hydroponics include commercial farmers, equipment retailers, researchers, hobbyists, and every other person in the supply chain or on the demand side. The experience of anyone producing food in a new way offers useful information for their peers. For example, since the 1970s, many new commercial nutrient solutions have come from the success of home gardeners as they experimented. Farmers who use new technologies like hydroponics are almost always evangelists for the technology’s expansion. Environmentalists want more because it helps limit pollution and conserve resources, foodies want more because it makes food fresher, and residents want more because it creates local economic growth. Only the occasional predatory businessperson is seeking to limit increased knowledge of new agricultural techniques, and that person is likely to be left behind as collaborators learn faster. Hydroponic optimists usually point to cheaper prices and new technology as the reason hydroponics is expanding so rapidly, but they often underestimate the strength and interconnectedness of the community itself as a driving force in the industry’s expansion. It’s a welcoming community, trying to create something together. By sharing experiences, the robust hydroponics community helped me leapfrog into a phase of my company, LocalSprout, where I can make food more sustainable and delicious for the city I love. At the same time, I have shared my experiences and helped to build other farms and gardens across the world. Want to talk about it? Join us. Online networks in places like Windowfarms, LinkedIn, Reddit, GardenWeb, Hydroponics Online, and Helpful Gardener have devoted users who seek to collaborate and brainstorm together on projects that scale from home gardens to massive commercial operations.